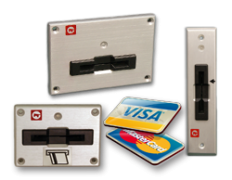 Cansec offers a range of stand-alone proximity, biometric & ATM access control products. The ATM 5000 Series of card readers are designed as self-cointained readers, where the controllers and the readers are all in one unit making installation a simple process. The optional BIN (Bank Identification Number) restriction feature offers increased protection from unauthorized access. Cansec’s line of ATM 5000 card readers are reliable and widely used.